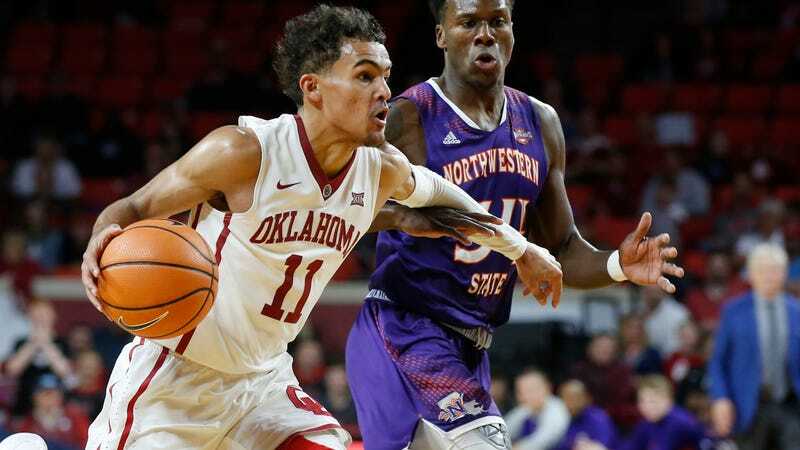 An Introduction To Trae Young, Who's More Than Just "Steph Curry 2.0"
Not even a dozen games into his NCAA career, Oklahoma’s Trae Young is already more valuable to his team than any other player in college basketball. The freshman point guard, born and raised in Norman, entered a program coming off an 11-20 season, and without any other can’t-miss one-and-done incoming players, Young has single-handedly made the Sooners relevant. Soon, he’ll take on the most exhausting conference schedule in the nation. Young first made a national name for himself when he dropped 43 points on Oregon over Thanksgiving weekend, which is still more than anyone else in the country has put up. But particularly in Oklahoma’s last three games, his play has become more and more consistently spectacular. Young scored 29 points and dished nine assists in a game two weeks ago at the Staples Center against USC. And on the road facing then-third-ranked Wichita State last weekend, he tallied 29 and 10 assists in his toughest match-up yet. Then on Tuesday, against admitted punching bag Northwestern State, he caught everyone’s attention with a 22-assist performance that tied the all-time D-I record. Young has been called “Steph Curry 2.0” by at least a couple of eager analysts, and if you watch him knock down threes, it isn’t hard to see why. He has that same beautifully quick shooting motion, setting up for long bombs out of nowhere and watching them arc perfectly through the net. But Young’s outside shooting, at 38.3 percent this season, could still use improvement. He’s also like Curry in that he’ll take a few ill-advised, overconfident shots every game, but the ratio of good shots to bad is still just a bit out of whack. That can be learned, though, and it’s an expected outcome of carrying so much of the scoring load. What really sets the freshman apart are the other parts of his offensive game. More than his shooting, his aggressiveness in driving to the basket, which nets him 8.7 free throw attempts per game, can endlessly aggravate opposing teams. Young is a pest, using his quickness and fearlessness to blaze a trail to the basket and dare you to stop him. You can hope he has a cold day from deep, but this is much harder to shut down. And his passing, which might be best in the nation, is what has truly transformed Oklahoma from an afterthought into a dangerous team. Young is currently the only player in the country averaging more than 10 assists per game, a fact made more impressive when you consider that none of his other teammates are standout talents. The Steph comparisons are eye-catching and understandable. But the truth is, Trae Young isn’t like any one player. He’s Lonzo Ball in his court vision and passing ability. He’s Kyrie Irving as he makes plays in the paint. And he’s Russell Westbrook in how his team would drown without him. The Big 12 is going to be relentless once again this year, without a single guaranteed win on the schedule, but no other school has a weapon quite like Trae Young. Duke Is ... Actually Kind Of Fun?